Coastal redwood trees (sequoia sempervirens) grow in a narrow band on the hills a few miles inland from the Pacific Ocean, over much of the western USA coast from Oregon as far south as Salmon Creek Canyon in the Santa Lucia Mountains east of Big Sur. 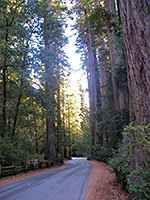 In California, the largest trees, and the most famous locations, are quite far north (Redwood National Park, Humboldt Redwoods), but many extensive groves are found around San Francisco Bay, both in Marin County to the north, at Mount Tamalpais and Muir Woods, and in the south, where the steep-sided mountains between San Jose and Santa Cruz are covered by dense redwood forests stretching over 30 miles. The largest protected area is the 18,000 acre Big Basin Redwoods State Park (created in 1902 - the oldest state park in California), and while most of this is rather inaccessible, a scenic road winds through the eastern corner and passes many hiking trails, both long and short. Land elevation in the park ranges from sea level to 2,000 feet on the mountain tops, and the weather is similarly varied - often cold and foggy by the coast but sunny and windy on the ridges. Only two main roads penetrate the Santa Cruz Mountains south of Silicon Valley; the quickest is Highway 17, the principal route from San Jose to Santa Cruz. The other, which reaches the Big Basin Redwoods, is Highway 9, also starting from Santa Cruz then heading up the narrow, winding San Lorenzo River valley before climbing over a ridge, across the San Andreas Rift Zone and descending into the San Jose suburbs at Saratoga. The southern half of Highway 9 is quite developed, and the road passes a continuous line of residences, small shops and rustic lodges, all nestled between tall trees on the steep slopes above the river, in such towns as Felton, Glen Arbor, Ben Lomond and Brookdale. The northern half is steeper, narrower, and largely undeveloped. The state park is reached by a side road (236) starting in the south at the village of Boulder Creek, and this is the most used approach, arriving at the park entrance station after 9 miles. Beyond this the route is even more bendy, though very atmospheric, as it reduces to a single track through particularly dark, deep forest, where the redwoods in places grow very close to the road. Road 236 meets Highway 9 once more at Waterman Gap, from where Saratoga is 13 miles further. The closest towns with hotels near Big Basin Redwoods State Park include: Ben Lomond (12 miles), Scotts Valley (19 miles), Santa Cruz (23 miles), Campbell (26 miles) and San Jose (30 miles). The headquarters of the state park consists of various log cabin buildings, a visitor center and a small shop, next to which is a huge redwood cross-section, illustrating the size and growth ring patterns of the trees. Nearby are several fire roads (closed to private vehicles), campgrounds, plenty of parking, half a dozen picnic areas and a number of trailheads. Entry (2019) is $10 per vehicle, with trail maps and brochures available for an additional fee. The place has a quiet, peaceful air - the forest is moist and cool, traffic is light, and once away from the road, the trails are little used. Like most parks containing trees, the main activities are hiking, biking & horse riding, though one trail is pretty much like any other. 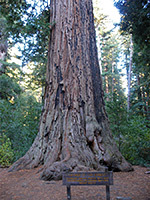 In the Big Basin, the redwoods grow in clusters between other trees - madrone, tanbark oak, Douglas fir - with large specimens generally quite isolated. The forest contains plenty of fallen trunks in various states of decay, plus a scattering of fire damaged trees both live and dead. Other places show signs of past timber operations in the form of sawn-off stumps and sectioned logs. The woods are well watered, crossed by small trickling streams and dotted with marshy meadows, and the thriving plant life includes large amounts of Spanish moss, draped over the conifer branches. Near the visitor center, quite a few trees have been sponsored, and bear a name plate identifying their benefactor. 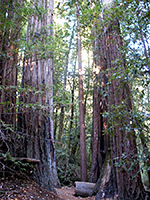 Big Basin Redwoods State Park has over 80 miles of trails, mostly in the remote western and central regions. The shorter trails around Highway 236 are described below. Creeping Forest Trail - many old growth redwood trees line the 1.5 mile Creeping Forest Trail, which climbs quite high up a ridge, starting a little way along the North Escape Road near the park headquarters. Some of the older trees are tilted away from vertical because of past seismic activity. A loop hike can be made via the Dool Trail. Dool Trail - starting a short distance north of the visitor center, the Dool Trail climbs 400 feet up the hills above Redwood Creek, a tributary of Opal Creek, to a vehicle track (Middle Ridge Road). A mile north, this road reaches 1,685 foot Ocean View Summit. Pine Mountain Trail - climbing 1,000 feet over 2 miles to a rocky peak (Buzzard's Rest) with fine views over the eastern half of the state park, this is a moderately strenuous trail, that passes varied forests of redwood, oak and pine before ending at a weathered sandstone rock formation on the summit. Redwood Trail - the shortest, easiest and most popular path through the Big Basin Redwoods is a 0.6 mile loop alongside Opal Creek, starting just south of the park headquarters. 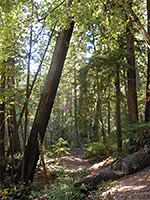 A trail guide is available at the start, describing 11 numbered points of interest, which include the largest and oldest redwood trees in the area, known respectively as Father of the Forest and Mother of the Forest. Sequoia Trail - this fairly level, 2 mile route follows two creeks, close to the main road then alongside the Sky Meadow Road, passing many redwood trees, two walk-in campgrounds, an unusual moss covered outcrop known as Slippery Rock, and a 15 foot waterfall (Sempervirens Falls). There are several route options for loop hikes back to the start. Shadowbrook Trail - from Sempivirens Campground, the Shadowbrook Trail heads north through the forest alongside Sempivirens Creek then Union Creek, before crossing a ridge and meeting the Sequoia Trail at Sempervirens Falls. Skyline-to-the-Sea Trail - the full length of this cross-country trail is 30 miles, starting at Castle Rock Ridge near the high point of the Santa Cruz Mountains and reaching the Pacific Ocean at Waddell Beach. Most is within the Big Basin, and the section alongside Opal Creek near the main road is suitable for short hikes, as well as intersecting various other paths including Creeping Forest, Dool and Sunset.